A free YouTube downloader online is a great helper when you are downloading YouTube videos. Most users can find many YouTube downloader online service from the Internet, including KeepVid, VideoGrabby, SaverFrom.net, VideoGrabber, ClipConverter.cc and more. How to choose the best YouTube downloader online? You can refer to the top 15 best YouTube downloader online software provided in this article which allow you to download any YouTube video for free. iTube Studio Best YouTube Downloader is a free YouTube downloader that allows you to download any videos from YouTube for free. 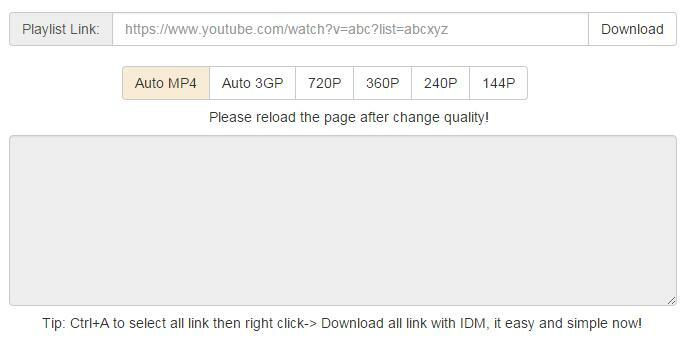 You can download YouTube HD 4K videos at super fast speed. This YouTube downloader app allows you to download high quality videos from YouTube and hundreds of other video sharing websites, including Break, VeVo, Vimeo, Metacafe, Dailymotion, and several others. The application is designed to provide you with fast and seamless video downloading, and it comes with a download button integrated into your browser, which automatically detects when the videos starts playing and appears. The application also comes with a video converter, which allows you to convert the downloaded videos into various supported format, for easier viewing on other devices such as your iPad, iPod, or your iPhone. Equipped with a one-click download button that automatically appears to make it easy to download YouTube and other 10,000+ video sites. Use the latest multi-threading download technology, with 3X faster download speeds compared to other download managers. Come with a built in converter that allows you to convert your videos into various formats for easier offline watching. Library where you can sort the downloaded videos, as well as a high-tech video player to watch the videos within the YouTube downloader. Video recorder which helps capture any online video or live sessions from any page even those "unable to download sites". Offer a Private Mode to keep your video downloading information under protection with a password known by yourself only. Go to YouTube and playing the video you want to download. A "Download" button will appear on the left top corner of the video screen. Click on the button and select your desired resolution from the drop-down list to start downloading the video. Alternatively, you can copy the URL of the YouTube video and then click on the "Paste URL" button located on the program's main interface. This will immediately capture the video and start downloading it. 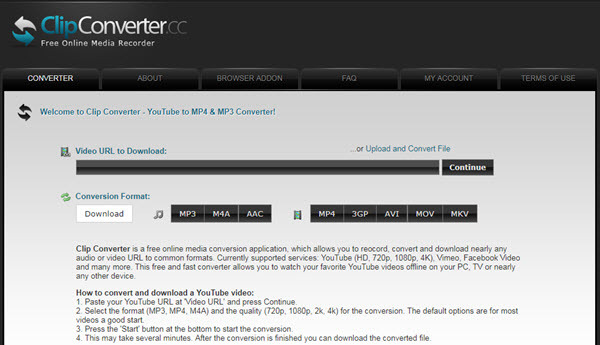 ClipConverter.CC is one of the best online tools for downloading high quality YouTube videos. It is a free application that allows you to download nearly any video or audio file, as long as you have its URL. It supports downloading of high definition videos (720p, 1080p, and even ultra HD 4k videos) from YouTube and several other websites such as Vimeo, DailyMotion, VEVO, and several others. It also comes with a built in converter that allows you to convert the videos into several supported formats, thus giving you an easier time when watching them offline. It is very easy to use, you just need to paste the video's URL to start downloading. It supports downloading of high quality videos, including Ultra HD 4K videos. It supports several video formats, 3GP, MP4, AVI, and MOV. Downloading might take a bit much time, especially when the application is converting the video into your desired format. It has a mandatory requirement for installation after which you will be able to freely download videos from YouTube and sites like Facebook and many others. Each of these sites has specific instructions for downloading videos and that is what you must follow to the letter. 3GO, MP4, MP3 and WEBM formats are the commonly supported ones by SaveFrom.Net and there are several others that you can have a look at when necessary. SaveFrom.Net has add-ons from opera which is a feature that makes it effective enough when it comes to downloading the YouTube files. However, the add-ons will mostly be dependent on third-party websites which can come with serious disadvantages. This one rates highly as one among the equals when downloading YouTube files online and it is fast as well as easy to use. 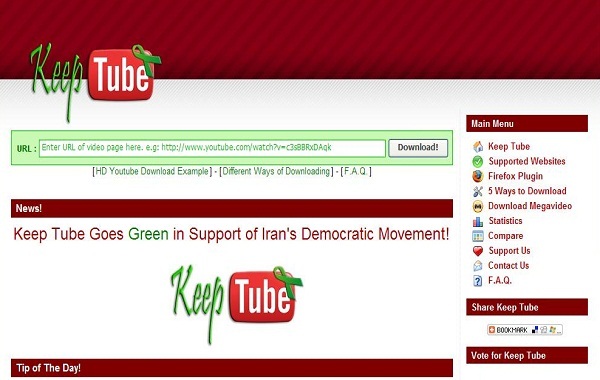 Keep-Tube includes only three simple steps for downloading YouTube videos which will save you a lot of time. It is advantageous in that no additional software will be required to have downloads fully accomplished. Keep-Tube supports key formats that include MP4 and FLV because they are fully compatible with iPod and iPhone. It features high quality and high definition download options. As the name suggests, this downloader will allow you the opportunity to grab videos freely from limitless online sites that include YouTube. It will allow you to conduct a thorough search of the best videos that you want to download to your PC and mobile device with ease. The key output settings for this downloader include AVI, MP4, MOV, MP3, AAC, MKV, MPG, WAV, WMA and 3GP among several others. The big advantage of using this downloader over others is that you will be able to freely manipulate video settings for resolution, frame rate, sample rate and channels as well as bitrate. That definitely means you will be able to determine the quality of your downloaded YouTube video. This downloader has a user guide that you can use to systematically download YouTube videos to your mobile device or PC. You have no reason to complain because Videodownloadx will offer more than you will be expecting. Its main formats are FLV, MP3 and 3GP with several others coming up for your consideration as well. The only disadvantage experienced with Videodownloadx by many customers is the unreliable "convert" feature that can fail you miserably when least expected. Free video downloader is the outstanding feature that Videodownloadx can boast of. It is a downloader that allows for free streaming of videos from multiple sites that include YouTube. If you are looking for a simple and easy way to download YouTube files then Savemedia will serve your interests well. It has a unique feature called "keep it super simple" which captures the real essence of its enhanced performance in downloading YouTube videos online. Savemedia has total compatibility with formats like AVI, FLV, MP3, MP4 and WAV among many others. Its performance depends on internet connection thus it will be poor performing if internet connection is poor and vice versa. That aside, Savemedia can perform beyond your expectations. If you have files under the MPG, AVI, FLV or WMV formats, Savevideo will be the best choice whenever looking for the right online YouTube downloader to use. It works through quick detection of links available for downloading purposes. However, they use a third-party server which will of course bring to birth myriads of challenges. That is why Savevideo does not shoulder blame for some of the problems associated with YouTube downloading because it is not directly involved. The conversion process for YouTube files to different formats is more or less the same so expect very minimal difficulties. This downloader like many others demand for patience before it can work and deliver effectively. You should not rush over anything but take a step at a time. The downloading process with Catchvideo is very slow and that can discourage you if not patient enough. However, the downloading speed will in many cases depend on the size of the videos being downloaded. It works well with a long list of file formats that include FLV and MP4 for video as well as AAC and MP3 for audio. It has the audio extraction feature which will be an added advantage to the user with multiple demands. Apart from YouTube, SaveVid supports related sites like MySpace, Vimeo, Break and Veoh from where you can download enough videos. 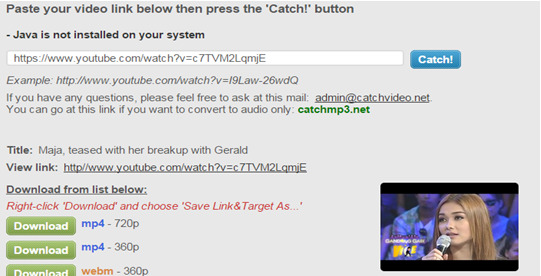 Its simple interface is one thing to enjoy with SaveVid because you can type the URL link of the video to download. The worst aspect of SaveVid is that it does not allow for batch downloads meaning you will take a lot of time downloading one video at a time. It might not be the right online solution for you if at all you want to have loads of videos downloaded. MP4, MPG, AVI and WMV are the common formats supported by this downloader. This downloader offers FLV, MP4 and 3GP as the major formats that you can download YouTube files in but there are others as well. You do not require a third-party software program to aid in the downloading process. Its user interface is excellent and does away with any manual downloading of YouTube videos like copying and pasting the URL link. Ideally, it is one of the few downloaders that have aligned well with the requirements of modern technology. The aggregation service feature is best for making the downloading process faster and simpler. Furthermore, you will enjoy convenience when using Deturl.Com and it is a benefit you will always cherish. OnlineVideoConverter is another online video download application that allows you to download videos from YouTube and other similar video databases such as Vimeo and Dailymotion. It is a web application, and thus does not require you to install any software on your computer. OnlineVideoConverter also comes with a super fast video converter that is built into the application, which allows you to convert your videos into the supported formats. This ensures that you can easily view them offline on your devices. It does not require you to install any software on your computer. Very easy to use with just three simple steps: Enter the url of the video; Select desired format; Start the conversion and download process. Since the video has to be converted first into the format you choose, downloading takes a bit more time compared to other tools. 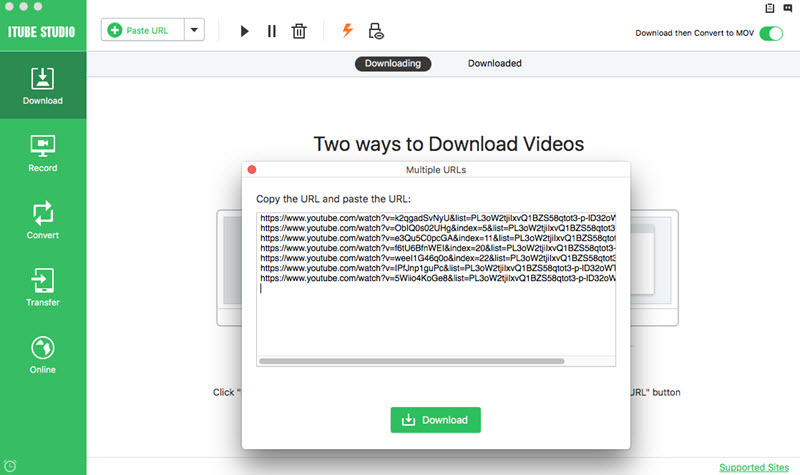 YouTubeMultiDownloader is a free online download application that enables you to easily download videos without installing a download manager on your computer. With this application, you just need the URL of the video or audio file you want to download. It offers fast downloading of high quality videos, including high definition (720p and 1080p), and Ultra High Definition (2K and 4K). The application also supports downloading of videos in batches, including an entire YouTube playlist. It is very easy to use, and just requires you to provide the link for the video you want to download. It supports YouTube playlist download. 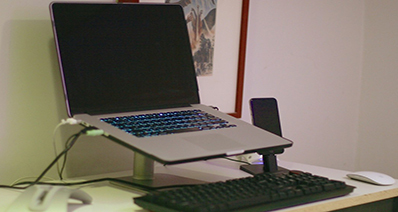 It is fast, and supports downloading of high quality videos. The application does not support downloading of 480p videos or those with a lower resolution (360p and 240P). VideoGrabby is a free YouTube video downloader mac online, which allows you to download your favorite videos from YouTube and other video sharing websites. The application supports both normal and high definition videos, and it comes with a minimal interface that is designed to offer you the seamless video download process. In addition, VideoGrabby supports audio format, and you can choose to download the file as a video or an audio. It is easy to use, allowing you to download videos with just one click. It supports high quality HD videos. 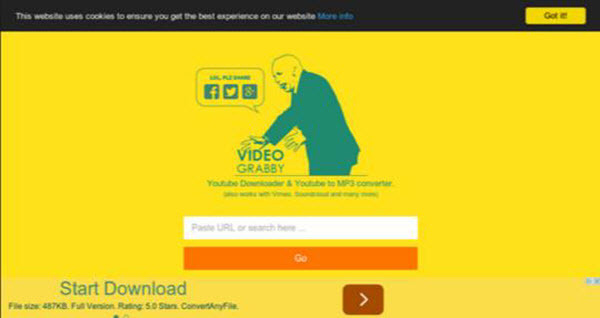 Unlike most online YouTube download tools, VideoGrabby does not come with a converter. The above YouTube video downloader online are great when you need to download YouTube videos without having to install a software on your computer. However, they come with a number of limitations, for example, slow download, low quality, and a few supported formats, which can inconvenience you when you are downloading or watching your videos. Fortunately, there is a simple solution for this, which is getting a good desktop download application. When it comes to Mac computers, one of the best desktop YouTube download managers is Best YouTube Downloader.